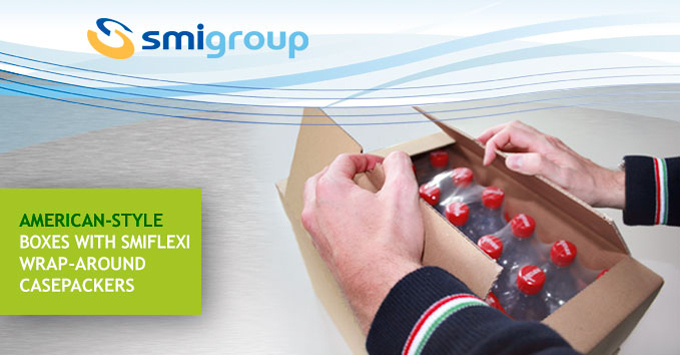 Smiflexi packers enable countless customization options of the packaging format, such as top-opening corrugated board boxes; that type of packaging, known in the industry as "American-style box", is usually processed by casepackers using a system that erects the box and inserts the products which differs from the wrap-around system used by Smiflexi packers of the LWP, WP and CM series. Since now on, SMI customers can also package their products in "American-style boxes" that can be opened from the top, without giving up the advantages of the wrap-around system, thanks to the high flexibility of Smiflexi machines; these latter, in fact, can also process a type of cardboard blank on purpose designed to keep the opening flaps in the upper part of the cardboard case coming out of the packaging process. 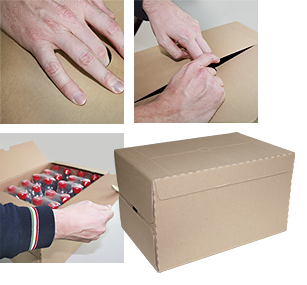 The cardboard case erected as outlined above can be easily opened from the top, while maintaining the package integrity and preventing products from falling out of it. This packaging solution enabled by Smiflexi packers of LWP, WP and CM series is highly appreciated by supermarkets and mass retail chains as it allows to display the whole box on a shelf without removing the single product units from the inside; in fact, the top-opening feature allows consumers to conveniently take out of the package just the single product units they actually need.